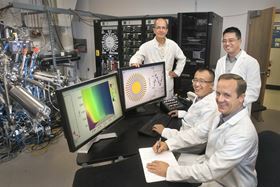 Brookhaven Lab scientists (left to right) Ivan Bozovic, Xi He, Jie Wu and Anthony Bollinger with the atomic layer-by-layer molecular beam epitaxy system used to synthesize the superconducting cuprate samples. Photo: Brookhaven National Laboratory. The perfect performance of superconductors could revolutionize everything from grid-scale power infrastructure to consumer electronics, if only they could be coerced into operating above frigid temperatures. Even so-called high-temperature superconductors (HTS) must be chilled to hundreds of degrees below zero. Now, scientists from the US Department of Energy's (DOE) Brookhaven National Laboratory and Yale University have discovered new, surprising behavior by electrons in a HTS material. The results, published in a paper in Nature, describe the symmetry-breaking flow of electrons through copper oxide (cuprate) superconductors. This behavior may be linked to the ever-elusive mechanism behind HTS. "Our discovery challenges a cornerstone of condensed matter physics," said lead author and Brookhaven Lab physicist Jie Wu. "These electrons seem to spontaneously 'choose' their own paths through the material – a phenomenon in direct opposition to expectations." In simple metals, electrons move evenly and without directional preference – think of a liquid spreading out on a surface. The HTS materials in this study are layered, with four-fold rotational symmetry of the crystal structure. Electric current is expected to flow uniformly parallel to these layers – but this is not what the Brookhaven group observed. In another twist, this symmetry-breaking voltage persisted up to room temperature and across the entire range of chemical compositions examined by the scientists. "The electrons somehow coordinate their movement through the material, even after the superconductivity fails," said Wu. "The most difficult part of the whole work – and what helps set us apart – was the meticulous material synthesis," said study co-author Xi He. This work formed part of a larger project that took 12 years and encompassed the synthesis and study of more than 2000 films of lanthanum-strontium-copper-oxide superconductors. "This scale of research is well-suited to a national laboratory environment," said Ivan Bozovic, who leads the Brookhaven group behind the effort. The group used a technique called molecular beam epitaxy (MBE) to assemble complex oxides one atomic layer at a time. To ensure structural perfection, the scientists characterized the materials in real time with electron diffraction, in which an electron beam strikes the sample and sensitive detectors measure precisely how it scatters. That finding suggested that the so-called ‘normal’ metallic state, which forms above the critical temperature threshold at which superconductivity breaks down, might also be extraordinary. Looking carefully, the scientists found that as external current flowed through the samples, a spontaneous voltage unexpectedly emerged perpendicular to that current. "We first observed this bizarre voltage over a decade ago, but we and others discounted that as some kind of error," Bollinger said. "But then it showed up again, and again, and again – under increasingly controlled conditions – and we ran out of ways to explain it away. When we finally dove in, the results exceeded our expectations." To pin down the origin of this phenomenon, the scientists fabricated and measured thousands of devices patterned out of the HTS films. They studied how this spontaneous voltage depends on the current direction, temperature and the chemical composition (the level of doping by strontium, which controls the electron density). They also varied the type and the crystal structure of the substrates on which the HTS films are grown, and even how the substrates are polished. At the molecular level, common liquids look the same in every direction. Some, however, are comprised of rod-like molecules, which tend to align in one preferred direction. Such materials are called liquid crystals – they polarize light and are widely used in displays. While electrons in common metals behave as a liquid, in cuprates they behave as an electronic liquid crystal.